Do you open multiple AutoCAD drawings when you work? I do. In old version of AutoCAD (pre-ribbon version), I can quickly switch between drawings by pressing [alt] + W then a number. Now we have to cycle between drawings by using switch windows in view tab. We can put it on quick access toolbar so we can switch faster. However, I still think this is not as convenient as it was. If you feel the same, I found this thread in CADtutor forum. Thanks to ReMark, I found out that we can use [ctrl] tab to switch between drawings forward! You can also switch between drawings backward using [ctrl] + [shift] tab. Thank you to Paujrobe for the additional tip! In AutoCAD, there is also quick view drawings. You can click quick view button on status bar and see all opened drawings’ thumbnail. You can activate a drawing by clicking the thumbnail. You also can pin quick view drawings and let it always show. Nice to have it when we are reviewing several drawings. Quick view drawings was introduced before we have Windows 7. In Windows 7, we can see similar feature in taskbar. 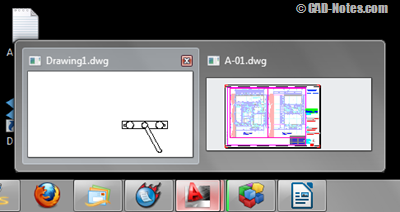 You can hover (or click) AutoCAD icon on taskbar to see opened files. Click on file you want to activate. If you don’t see the taskbar like this, check your TASKBAR system variable. If you want to set it like Windows 7 default, set it to 1. If you prefer the old style like in Windows XP, set it to 0. I think using [ctrl] tab is very nice. However, if I open many drawings at once, I prefer to use switch windows on my quick access toolbar. What about you? This helps me immensely. Don’t know why AutoCAD felt like they had to move it. Thanks so much!!!!!! Unfortunately, Quick View Drawings is anything but quick. I think it was already mentioned in the comments. Edwin, switch view in view tab must be Switch Windows in View tab. I use the free Autodesk MDITabs that places a line of tabs on the screen for each open drawing. Then it is only 1 click to switch between drawings. A right click on the tab opens up a wealth of other commands such as Save, Save As, Close, etc. Google search for MDITabs18.arx to find a download of the file. For years I have use the Ctrl +Tab to scroll through the drawings that I have open. It works very well when you have 2 or 3 drawings open, but can be a little more cumbersome when you have more because they scroll in the same order. As far as I know you can't scroll backwards. I find this easier than moving to the ribbon or using the quick view that blocks the current drawing. Use Ctrl + Shift + Tab to scroll backwards. My mistake, I should read more carefully as it's already written. I was thrown off by the grouped windows. No problem :) Happens to me to… many times! One other option is to set the TASKBAR variable to 1. This will show each drawing individually in the Windows taskbar.